Throughout the Bible we see time and time again where God’s own people turn their backs on Him. Some of you reading this don’t love God the way that you used to. Prayer is a burden now. Reading Scripture is a burden now. You don’t witness to the lost anymore. Your worship life is dull. You don’t talk how you used to talk. You’re changing. Something is taking over your heart and it must be dealt with now. When a Christian backslides people know. Don’t you understand that you might be the only hope that an unbeliever has? When you backslide you kill unbelievers of hope! Your backsliding can be the reason that someone doesn’t get saved and goes to Hell! This is serious! You might say, “well I don’t want the responsibility,” but it’s too late for that! When you backslide you become a coward. You have no power. You have no testimony. You can only talk about things in the past. You can’t smile anymore. You have no boldness in the face of trials. You can’t witness anymore. You live as if you have no hope and unbelievers look and say, “if this is his God I don’t want Him.” His own children have no hope in Him. When you start backsliding in your prayer life you start backsliding everywhere else. When you are cold and failing in your prayer life you will lose the presence of God. Why do you think that Satan hates praying men and women? 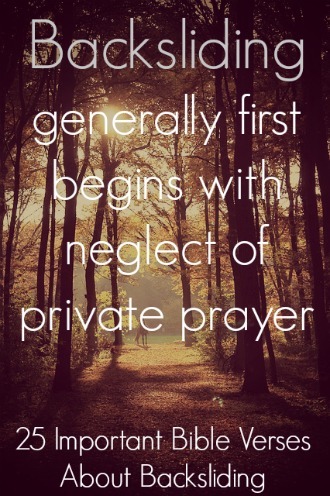 You need to readjust your prayer life now. You will backslide if you haven’t yet done so. 2. Colossians 4:2 Devote yourselves to prayer, being watchful and thankful. God’s people have a habit of turning their backs on the Him and going their own way. Throughout Scripture we read about the continuous backsliding of Israel. 3. Hosea 11:7 And my people are bent to backsliding from me: though they called them to the most High, none at all would exalt him. 4. Isaiah 59:12-13 For our offenses are many in your sight, and our sins testify against us. Our offenses are ever with us, and we acknowledge our iniquities: rebellion and treachery against the LORD, turning our backs on our God, inciting revolt and oppression, uttering lies our hearts have conceived. 5. Jeremiah 5:6 Therefore a lion from the forest will attack them, a wolf from the desert will ravage them, a leopard will lie in wait near their towns to tear to pieces any who venture out, for their rebellion is great and their backslidings many. 6. Jeremiah 2:19 Your wickedness will punish you; your backsliding will rebuke you. Consider then and realize how evil and bitter it is for you when you forsake the LORD your God and have no awe of me,” declares the Lord, the LORD Almighty. 7. Hosea 5:15 I will go and return to my place, till they acknowledge their offence, and seek my face: in their affliction they will seek me early. 10. Hosea 14:4 I will heal their backsliding, I will love them freely: for mine anger is turned away from him. Jonah was a great man of God, but he backslide from the will of God and went in his own direction. God sent a storm to put him back on the right path. Not only did the storm affect him, but it affected others around him. If you are God’s child and you backslide God will send a storm to bring you back. Your backsliding can result in trials for other people around you as well. It is dangerous to backslide and it is dangerous to be around a backslider. God will stop at nothing to get His lost child. When you backslide you are going to hurt your family, your friends, your co-workers, etc. When God sent His judgment on David thousands of people died. Even his child died. Sometimes God blesses your family and protects your family because you are saved and you seek His face, but when you backslide you will lose that favor. Your backsliding can cause someone else to backslide as well. 12. 2 Samuel 24:15 So the LORD sent a plague on Israel from that morning until the end of the time designated, and seventy thousand of the people from Dan to Beersheba died. Everything in this world seeks to take your heart. When you backslide something else has your heart. Most of the time it is sin, but not all the time. When something else has your heart you forget the Lord. Why do you think that the easiest time for you to backslide is when God blesses you? In times of prosperity you no longer need Him and you have gotten what you wanted. The church of Jesus Christ has become prosperous. The church has become fat and we have forgotten our Lord. The church has backslidden and we need a revival soon. We have to turn our hearts back to Him. We have to align our hearts back to His heart. When God answers a prayer be careful. You better seek God more than you have ever done in your life. You better wrestle with God that things don’t take your heart. 14. Revelation 2:4 But I have this against you, that you have left your first love. 17. Romans 12:2 Do not be conformed to this world, but be transformed by the renewal of your mind, that by testing you may discern what is the will of God, what is good and acceptable and perfect. 18. Isaiah 57:17-18 Because of the iniquity of his unjust gain I was angry, I struck him; I hid my face and was angry, but he went on backsliding in the way of his own heart. I have seen his ways, but I will heal him; I will lead him and restore comfort to him and his mourners. Sometimes a professing Christian did not backslide, but they are just not truly Christian. They are false converts. A Christian does not remain in a willful state of rebellion. Many people just have not truly repented of their sins. A Christian does sin, but a Christian does not live in sin. A Christian is a new creation. Understand that I am not saying that a Christian can lose their salvation, which is impossible. I am saying that many were never Christian to begin with. 20. 1 John 3:8-9 Whoever makes a practice of sinning is of the devil, for the devil has been sinning from the beginning. The reason the Son of God appeared was to destroy the works of the devil. No one born of God makes a practice of sinning, for God’s seed abides in him, and he cannot keep on sinning because he has been born of God. When God doesn’t discipline someone and lets them live their wicked lifestyle that is evidence that they are not His. 21. Hebrews 12:6-8 for the Lord disciplines the one He loves and punishes every son He receives. Endure suffering as discipline: God is dealing with you as sons. For what son is there that a father does not discipline? But if you are without discipline—which all receive then you are illegitimate children and not sons. A Christian hates sin. Sins affects him now. A Christian has a new relationship with sin and if he does fall in sin he is broken and runs to the Lord for forgiveness. 22. Psalm 51:4 Against you, you only, have I sinned and done what is evil in your sight; so you are right in your verdict and justified when you judge. After you repent that doesn’t mean that you won’t still be in a trial or suffer the consequences of your sin. But God says to wait because He is going to bring you out of the darkness. 23. Jonah 2:9-10 But I, with shouts of grateful praise, will sacrifice to you. What I have vowed I will make good. I will say, “Salvation comes from the LORD.” And the LORD commanded the fish, and it vomited Jonah onto dry land. Some of you are in the darkest pit. You have been thinking that you have gone too far and that there is no hope for you. You have been thinking that it’s too late for you and you have brought too much reproach on the name of God. I’m here to tell you that God loves you and there is nothing impossible for the Lord. If you cry out to God for deliverance, He will deliver you! It’s not too late. If you allow yourself to live in despair and guilt you can die in that state. Don’t listen to Satan. There is hope for you. The blood of Christ will wash away your shame. Jesus said, “it is finished” on the cross. God will restore everything. Cry out for Jesus to deliver you now! 25. Psalm 34:4-5 I sought the Lord, and he answered me and delivered me from all my fears. Those who look to him are radiant, and their faces shall never be ashamed. Proverbs 14:14 The backslider in heart will be filled with the fruit of his ways, and a good man will be filled with the fruit of his ways.